Roman Hazelnuts - Zuercher & Co. 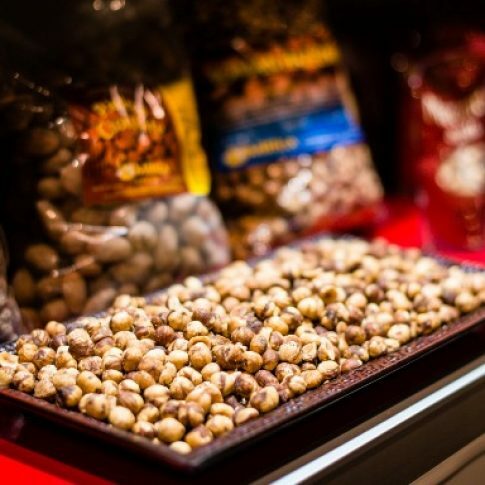 These hazelnuts come directly from the grower in the countryside of Rome, who then toasts them lightly to enhance their flavor. Roman Hazelnuts are comprised of a protective skin and the fruit. This skin stays partially attached to the fruit, even after toasting. It is precisely this protective skin that makes Roman Hazelnuts outshine their counterparts. It seals in their exceptional aroma and characteristic sweetness. The hazelnuts are never bitter like some other varieties. A perfect accompaniment to any cheese.